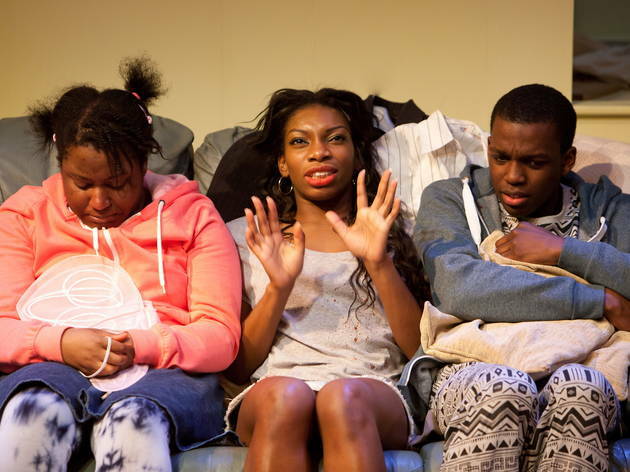 The three kids in Polly Stenham’s 2009 play ‘Tusk Tusk’, abandoned in Chelsea by their alcoholic mother, have got nothing on the ‘three birds’ in Janice Okoh’s similarly themed Bruntwood Prize-winning play. 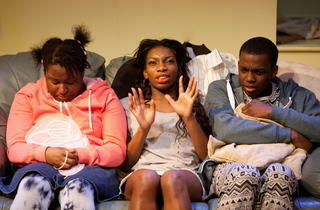 With mum absent – apparently eloped with a man and his BMW – the trio of teenagers are holed up alone in a south London sink estate, surviving on a diet of Cheestrings and pipe dreams. Debt-collector Dr Feelgood is knocking at the door and any hint of their predicament would see social security swoop in and split them up in an instant. It’s a seriously ambitious piece with a weighty social conscience. These kids are doomed from the off, and for all their talk of ‘MTV Cribs’ and Justin Bieber’s back catalogue, the eldest Tiana (a desperately upbeat Michaela Coel) can’t even deliver McDonald’s chips as promised.